If you’re in ecommerce, you’ve got an email list. Maybe you grew your subscribers with a few lead magnets. Or maybe you gathered leads from a giveaway you hosted. At the very least, you have the email addresses of those who have purchased from your site. The question is, what are you doing with that list? If you’re just letting it gather dust, you’re leaving money on the table. Email marketing has a whopping 3,800% ROI. That means for every $1 you invest in email, you’ll get $38 back. And the best part? Email marketing can do the selling without you lifting a finger. Welcome to the beauty of email automation. To make the most of your email marketing, here are the four email automations you should set up for your ecommerce business, today. If you’re not sending an email welcoming your new subscribers, you’re missing out on a prime opportunity to build a relationship with your customers. The best metaphor I’ve seen for a lack of a welcome email is from Constant Contact, which likened it to someone walking into a store and being ignored. That customer is highly unlikely to buy; in fact, they’re probably going to walk out. Don’t let this happen to your email list subscribers! Your first email to a subscriber is your first impression—so you want to make sure you nail it. Like many other business processes, it should be automated to be sent the instant someone subscribes to your list. When someone joins your ecommerce email list, they’ve just walked into your store and are looking around. Be polite and start building a relationship by walking up to them, introducing yourself, and letting them know how you can help. You can accomplish all of this with your welcome email. A cart abandonment email is an email marketing automation that gets sent to every customer who adds something to their cart but does not complete their purchase within an hour or two. You can see why this is so powerful, right? Lots of shoppers add items to their cart, and given the nature of the internet, get sucked into another window or tab and forget about your site. Baymard Institute looked at 37 different studies on ecommerce shopping cart abandonment and calculated that the average cart abandonment rate is around 69%—that means for every 10 people who start a purchase on your site, nearly seven will leave without buying. But there’s a powerful way you can get them back. You guessed it—email. Remind your customer of what they left inside the cart. Reiterate the benefits of your products. Offer a discount to encourage them to complete their purchase. Make it time-limited to add a sense of urgency. And don’t stop at just one email. Sending three abandoned cart emails results in 69% more orders than a single email, according to research by Omnisend. Your customers have come this far—they’ve put the product in their basket and are standing in the checkout line! If they get distracted and wander off, your abandoned cart emails will swiftly guide them back to the cash register to complete their transaction. If it’s been a few months since a customer returned to make another purchase from your site, it’s a great idea to try to re-engage them by reminding them how awesome your products are! Think this won’t make much of a difference to a dormant customer? Think again. Retail business Howards Storage World sent a re-engagement campaign to customers who hadn’t shopped in 12 months or more and saw a $108,000 increase in revenue—a higher ROI than that of their “super members” list. Another way you can re-engage a dormant customer is to remind them of all that you have to offer. You could send an email with a section that says, “Items you might like,” along with images of and links to your products. If a subscriber hasn’t opened an email from you in a couple of months, it’s time to send them a re-engagement campaign. The reasons for this are twofold: one, email service providers charge you based on your number of subscribers, so you’re paying for the ones who aren’t even active. And two, this is a prime opportunity to re-engage a customer and get them to purchase. Before you give a cold subscriber the boot, it’s nice to give them fair warning. I recommend sending three emails to a give a subscriber a chance to open one before you delete them from your list. To remind them of the value you provide, give them an incentive to stay on your list. This can be in the form of a free download, a discount code, or some other small gift. Second email: Discount or special offer. If a question didn’t work, a discount usually will! Make it clear in the subject line that if they open your email, they’ll be rewarded. Examples might be “Open for 25% off” or “Your gift is inside.” In the body of the email, explain that they will be unsubscribed at a certain date unless they click a link. Then, to soften that blow, offer a discount or gift as a thank you for staying subscribed. Third email: Last chance. If all else fails, it’s time to remove them from your list. The third and final email can simply say “You’ve been unsubscribed.” This lets them know what has happened, in case they’re wondering where your emails went. When they open that email, there should be a link for them to click if they wish to resubscribe. Deleting any contact from the list you worked so hard to build is painful, but remember that regularly doing this keeps your list healthy and strong. It keeps your costs low, since you can avoid paying for inactive subscribers. Plus, it improves your open rates, since your list consists only of engaged subscribers. I recommend cleaning up your list every three months. Transactional emails, such as order and shipping confirmations, don’t get much love. And that’s a shame because, according to Experian, they get up to eight times higher open rates and earn up to six times more revenue-per-email than your average email! So what are some ways you can optimize the humble transactional email to boost your ecommerce revenue? No, it doesn’t directly boost your sales, but it eventually will. Getting them to install your app on their smartphone is yet another way to stay connected with your customers and eventually get them to purchase. 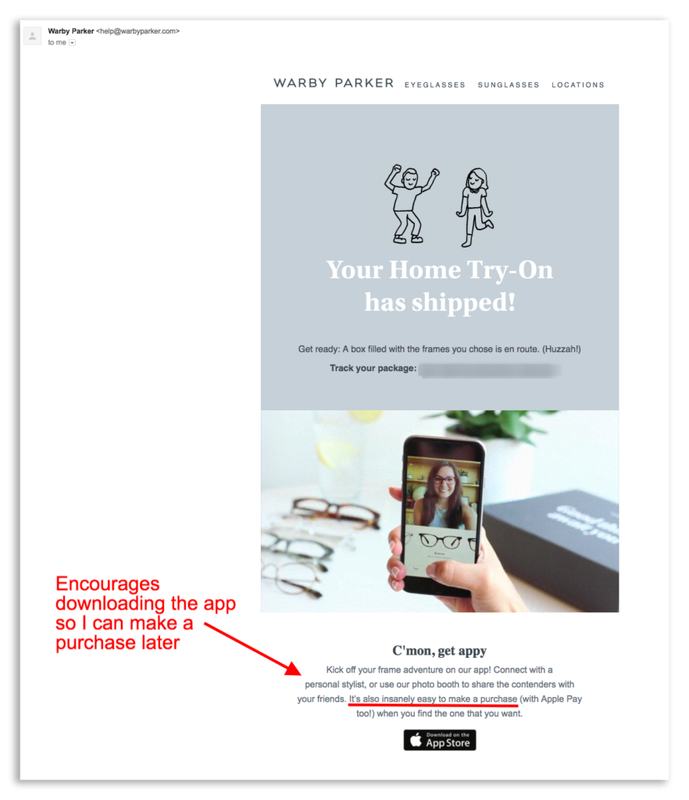 As you can see with the Warby Parker app, users can take photos of their at-home try-ons and even use the app to make a purchase. Similar to the app example above, social media is another way to market to your prospects outside of the inbox. So be sure to include your social media links in the footer of your transactional emails. This is more of a customer support element, but the way you handle customer support affects your sales too. On top of that, by sending a customer feedback email, you might just get a glowing testimonial you can use in your marketing (with permission from the customer, of course). As you can see, transactional emails can do more than just notify a customer when a shipment has been delivered. Put those emails to work, and you’ll see a boost in sales! Not only can transactional emails encourage users to buy more, but they’re also important for the customer experience. Your customer has just parted ways with their hard-earned cash; they want to be kept in the loop every step of the way. In fact, a study by Mailjet found that 41% of customers feel annoyed when they haven’t received an order confirmation within one minute. So keep your customers happy and boost your revenue by optimizing your transactional emails. If you use Shopify, you can try Spent.ly. It’s free and offers a premium version should you need it. Avoid spam trigger words. While you want your subject line and content to be juicy enough to get people to open up and click, there are certain words that could send your automated email straight to the spam folder, such as “free gift,” “act now,” and “order now.” Be sure to watch out for all of these spam trigger words. Determine the best day and time to send emails. There’s a lot of debate in the email marketing world about the “best” day and time to send emails, but truth be told, it depends on your industry and even on each business. I recommend split testing to determine what’s best for you. Regularly check your analytics and tweak as you go. As you implement these different email marketing automations, it’s important you check analytics as you go so you can tell if it’s really working for you. Every automation will need to be tested and tweaked. Never underestimate the power of email marketing. Curious visitors will land on your website once, and then how will you ever get them to think of you again? When you’ve got an email list subscriber, that person has invited you into their inbox; don’t squander the opportunity! As we’ve seen, email can have high ROI. And once you set up an automation, it just keeps selling for you over and over again. Got any questions on implementing email marketing automations in your business? Ask away in the comments below! Thanks for your comment. Yes, for beginners, I always recommend MailChimp (which is what many of my clients used and what I first used). The reason for this is that MailChimp is free up to 2,000 subscribers, and it includes automations. So it’s a great email marketing service to start with!